A couple of weeks ago, I was leafing through the Guardian newspaper when I read yet another article on the Mediterranean diet. It feels strange that the type of food we’ve been eating all our lives has become the subject of extensive scientific research and discussion, when to us it’s just our daily habit. Yet the diet has been picked apart and analysed from all angles, and has been found to result in a longer life, less heart disease, protection against some cancers, a reduction in the risk of diabetes, Alzheimer’s and Parkinson’s, aiding in weight management and depression, improving rheumatoid arthritis and promoting better breathing. So we must be doing something right! Apparently, the latest scientific research on the Mediterranean way of eating has identified one of the reasons why the diet is as healthy as it is. It seems that when olive oil and vegetables are eaten together, they form nitro fatty acids that help lower blood pressure – a risk factor for heart disease – by blocking the enzyme epoxide hydrolase. “Is healthy eating that simple?” asks the Guardian reporter Joanna Blythman. In fact, yes it is. The Mediterranean diet couldn’t be simpler – the traditional Mediterranean diet, that is. Although a changing economy and lifestyle mean that the diet of many Greeks and Cypriots today isn’t what it used to be, there are still many of us who continue to eat more or less as our ancestors did – hundreds and even thousands of years ago. It’s not just the food that has remained the same; it’s also the philosophy and values around it: eating in moderation, being close to the land, and sharing with those around you. The ancient Greek historian Herodotus, who lived in the fifth century BC, wrote: "Τη Ελλάδι πενίη μεν αεί ποτε σύντροφος εστί" (Book VII, 102), meaning that our ancestors in Greece had poverty as their constant companion. The playwright Aristophanes used to stress that the Athenians prospered and developed due to the many deprivations they faced. And Demosthenes, the great orator, was also frightened of riches and luxuries. What did this lifestyle mean for the diets of the ancient Greeks? It meant that their food was simple. ‘Oligofaia’ (eating in moderation) was their moto (in fact, it’s one we still use today!). The main produce in ancient Greece was barley, wheat, wine, olive oil and olives. Other elements of the ancient Greek diet which we can deduce from the writings left behind include bread, vegetables, fish, cheese, lentils, beans, apples, pears, grapes, figs, plums and pomegranates. Fast forward several thousand years to the Cretan diet of 1956, when the American doctor Ancel Keys recorded the diets of 700 Cretans in the first large scale study of the benefits of the Mediterranean diet. All of these foods were still being eaten, and in fact still formed the bulk of the Greeks’ daily diets. Another half century later, we can look on our own kitchen tables and see the same foods. But of course it’s not all about the food. The Cretans of the 50s were largely an agricultural population. Day in, day out they would climb the mountains and roam the fields to tend to their animals and their crops. This relentless (and very healthy!) physical activity was broken up by frequent breaks for healthy snacks, often governed by the seasons – bread, onions, olives, figs, fruit or wild greens. And when they weren’t working, they’d come together to talk, laugh, sing and share their food and wine. Again, this is something that hasn’t changed over the thousands of years of our country’s history. (“Stay with me and share my food and wine," says Circe to Odysseus, realising the temptation of food and companionship as opposed to her love and her bed!). This hasn’t changed to this day. Food in Greece and Cyprus is very social. It brings you closer to your friends, family and neighbours, and there will always be something to share, however simple it may be. Recently, my neighbour brought me a bag of baby cucumbers from his field. Another neighbour came by to say hello and we sat on the patio talking and eating some of the succulent, flavourful cucumbers straight from the bag – I’ve never enjoyed cucumbers so much! Another example is when my friend Rena and I were recently catching up; she went inside to get a plate of figs and mousmoula (the small, yellow loquat fruit) which her husband had been given. A delicious, healthy snack to share! I was also recently visiting the home of someone in my village to get some fresh eggs from their chickens. While we were waiting for the husband to bring back the eggs, the wife took out a bowl of fresh pomegranates, cut some in quarters and shared these amongst her children and myself. We all sat around the kitchen table eating the delicious red fruit straight from the skin and catching up on the village news. These are just little scenes from daily life that show how food is Greece and Cyprus is enjoyed in company, with a light heart and a song. My grandmother, who was from the Greek island of Santorini, would advise her daughter (my mother) to make sure she ate with a light heart. “When you eat with your husband you must never be upset. If you’re upset then don’t eat together,” she’d say. 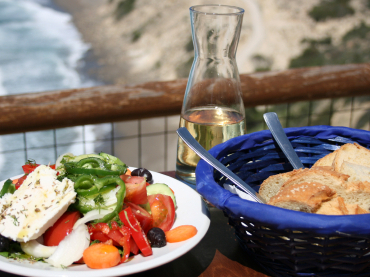 So is a healthy diet as simple as eating the Mediterranean diet? The answer is yes – but it’s not just about the foods we eat! It’s about where this food comes from, it’s about enjoying the food in company, about sharing and singing, about dancing and moving. It’s about simple food in moderation, good company in abundance, a light heart and an active lifestyle. All of our recipes on Yummy Cyprus are based on the traditional foods and ingredients eaten by generations of Greeks. And of course, they are all intended to be enjoyed in good company! Copyright © 2011 - 2019 YummyCyprus.com. All Rights Reserved. Kazeli Web Office - Business Referral Network.